With today being Bell’s Let’s Talk day, I’m thinking of Michael and his family. He is dearly missed by so many. I thought I would re-post this blog entry that I did from Everest basecamp on April 27, 2007. Michael Beecher Smith was a young man with a huge, huge heart. He passed away in January and the loss is huge. I taught Michael in two classes at Memorial University (MUN). He was a delight to teach and my mind is filled with fond memories of him. He was also on the wrestling team at MUN and so spent lots of time in the weight room. We often overlapped there and he was a huge supporter of all of my climbs. As a wrestler and weightlifter, Michael knew how to “play through pain.” He had to make weight for wrestling and he was always trying to get me to take my greens and other supplements because I was training so hard. Michael seemed just to know when to throw in an encouraging word or come over and tell me to push the bar a little further than I thought I could. I feel his spirit with me here on Everest. He was so excited for me. I have thought of him often when the going has been so hard. I know if Michael were alive today, he would be following my climb daily. With permission of his family, I decided to create a memorial for Michael here recognizing his spirit, his heart, and his tenacity in a way that will help me climb both the literal and figurative mountain in front of me. This morning I hiked out about an hour from basecamp towards Pumori and Gorak Shep. At a spot we call “The Ridge”, I climbed off the beaten path to a flat bench of land with a spectacular view. This special spot is on the shoulder of Pumori. 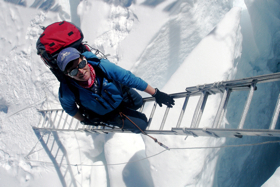 Pumori means “Daughter of Everest.” I’m taking liberties and thinking of Pumori as inclusive of “Son of Everest” as well. This ridgeline overlooks Everest basecamp, the Khumbu Icefall, and when there are no clouds, the summit of Mount Everest. At first, I thought I would build a memorial chorten as is tradition here, but since Michael did not die in Nepal, I came to a different vision. Michael grew up in the province of Newfoundland and Labrador. The aboriginal people of Labrador use Inukshuks (stone people) to mark paths and guide people along the featureless tundra. Thinking that we all need guidance and direction, I decided to build an inukshuk for Michael’s spirit. As I hauled each rock, I thought of each piece representing some part of Michael’s gifts and talents. It was tricky to get all the stones to balance on top of each other. During this time, I thought of Michael’s challenges and obstacles. 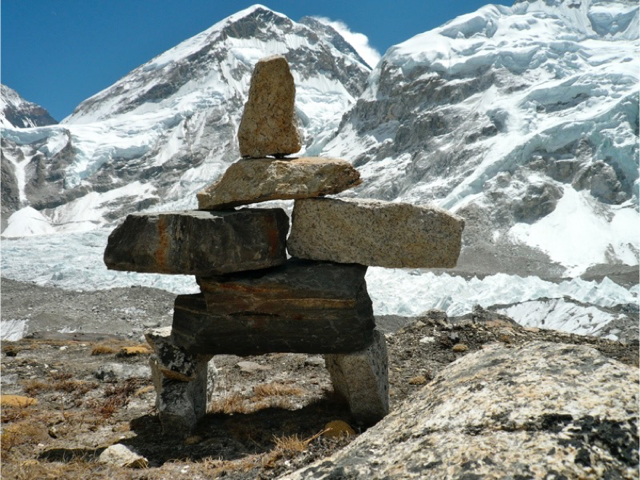 When I put the crowning rock into place and hung Tibetan prayer flags from the inukshuk’s shoulders, I thought of Michael’s fondness and appreciation of me. Michael understood that I am happiest when I can combine several passions into one moment. This morning, in Michael’s honour, I brought together mountains, teaching, spirituality, and stonework. I’m sure he would smile at the combination. After the sculpture was finished, I sat in silence absorbing the same view at the inukshuk (the same one as in today’s picture). When the time was right, I stood, touched the inukshuk’s shoulder, wished Michael peace, and returned to the main trail with my eyes awash in salt water. I hope in the next hours, days, and weeks that I can draw on Michael’s heart, spirit, and determination to do “the thing I think I cannot do.” (Eleanor Roosevelt). My thoughts and prayers are with Michael’s family as they make their way through this tremendous time of grief, loss, and sorrow. This entry was posted in Everest 3.0, Everest-007 and tagged 2017, Bell Let’s Talk, climb, Seven Summits, train. Bookmark the permalink.